How words "Alien" and "Predator" are translated in your language? Topic: How words "Alien" and "Predator" are translated in your language? So strange! I can't stop staring at it, and it back at me! I always kind of liked the AVP Requiem Japanese poster referred to as "AVP2". That was an official poster too! The word predator in Polish actually translates to "drapieżnik". If you were to literally translate that back to English, it would be "scratcher"! . I always get a laugh out of that. The title of alien in Polish was actually the Eighth Alien Passenger of Nostromo. Curiously, the word Alien in Polish as translated to "obcy" has a slightly different meaning. Obcy is more foreign than alien. The word alien as in the noun for a space alien, doesn't really exist in Polish. Obcy in Polish means foreign, strange, odd, peculiar, bizarre, rare, unusual, cosmic, extraterrestrial and so on. There are lots of synonyms. And yes, official Polish title is Obcy - 8. pasażer "Nostromo" which means Alien - The Eight Passenger of Nostromo. Yes, but in all of the above translations, obcy is an adjective. Obcy is rarely used as a noun. Even then it is still an adjective without a noun, making it.... a noun, sort of. It is often used as a command for a dog. If you yell, obcy, the dog is supposed to understand there is a stranger. A person can be obcy, but that is a short form of obcy człowiek, (strange person = stranger). The word alien as a noun which means extra-terrestrial doesn't translate into Polish. Not literally. That was actually one of the reasons O'Bannon chose the title -- it has many meanings. The word alien as a noun which means extra-terrestrial doesn't translate into Polish. Not literally. It does. Extraterrestrial in Polish is kosmita (noun), someone (not necessary human being) from outer space. But kosmita as a movie title for Alien wouldn't work because it would sound comical and not scary enough in Polish language. Sometimes is translated as little green man (ufoludek). Obcy sounds disturbing as there is more element of the unknown. Curiously, the word Alien in Polish as translated to "obcy" has a slightly different meaning. Obcy is more foreign than alien. As well as Chuzhyy in Ukranian and Chuzhoy in Russian. I haven't known about these similarities in meaning in other languages. Kosmita (female) and kosmitek (male) are very rarely used and certainly don't imply "otherness". It's a reference to the cosmos. Ufoludek translayes to UFO person. Yes these words exist but none of them hits the nail on the head in terms of a literal translation to Alien. Obcy was a good call for a title, though without the rest of the title, viewers may have have thought it was just a movie about a stranger going in. Boy would they have been in for a surprise! Hence the long title. Kosmita (female) and kosmitek (male) are very rarely used and certainly don't imply "otherness". Are you Polish? No offence but I have to correct you here . Kosmita is male (you said it was female) and kosmitka is female. Word kosmitek doesn't officially exist. Someone made it up. 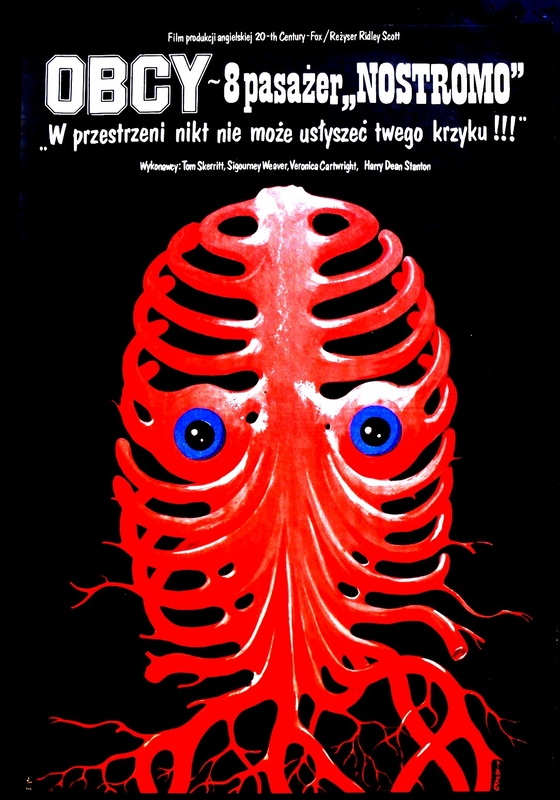 If I'm not mistaken only Polish title contains word Nostromo. Yah, I'm Polish but outside the country for nearly 40 years so take it with a grain of salt. ;-). Kosmita literally never comes up in conversation and I have lots of Polish friends. 10 points if you know what a kosmoczek is! It's interesting how translators manage to solve the problems of translation.